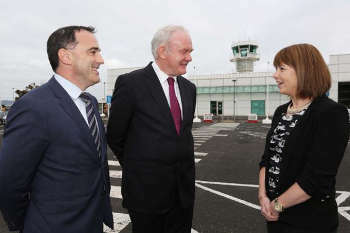 Ministers have signalled that they could step in to subsidise the Londonderry to London air route, albeit ‘with a value for money check to ensure the best outcome for taxpayers’. It follows an announcement by Ryanair that it will stop serving the route, which the Department for Transport (DfT) said is used by more than 125,000 people a year, next March. The DFT said it has invited Derry City & Strabane Council to put forward proposals to keep the route open and it can now undertake a tender process to appoint an airline to maintain its operation, ‘with support from the UK Government’. Aviation minister Lord Ahmad said: ‘Our airports are vital in supporting local economies, providing connections in the UK and opening up new opportunities. On Monday (19 September) the Northern Ireland Executive announced up to £7m support to assist development and growth around City of Derry Airport. The DfT said the route is a significant link for local businesses and the tourism industry, providing a connection with London that benefits the wider region. Officials said the move could mark the first ever UK Government backing for a public service obligation (PSO) in Northern Ireland. The Government maintains regional airport links through the Regional Air Connectivity Fund, which can be used to protect ‘important regional air connections’ that may be at risk. Separately, Manchester Airports Group, which is majority-owned by councils in the North West and owns Manchester, London Stansted, East Midlands and Bournemouth airports, said it contributed £6.2bn to the national economy last year. According to the group’s Corporate Social Responsibility Report 2015-16, its airports supported 39,600 jobs.